If you are unsure whether a traditional panto may fit the bill of your children’s Christmas entertainment, then I highly recommend “What the Ladybird Heard” at the Pavilion Theatre in Dun Laoghaire. 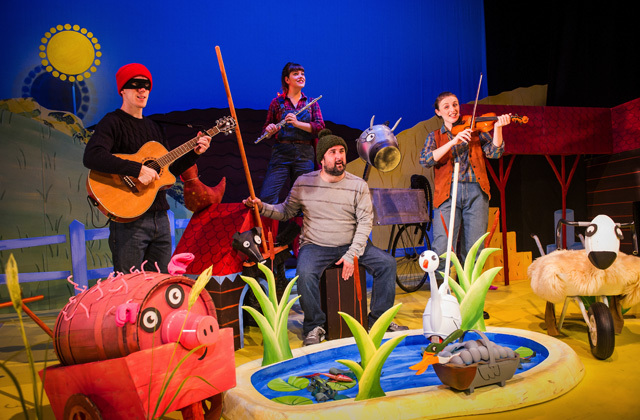 The show is the theatrical transposition of the popular picture book by Julia Donaldson and Lydia Monks. The book is one of those happy combinations of beautiful drawings and smart text, almost as appealing to adults as they are to children. While the visual part features very colourful images, the story is told in pleasantly rhyming and rhythmic verses. 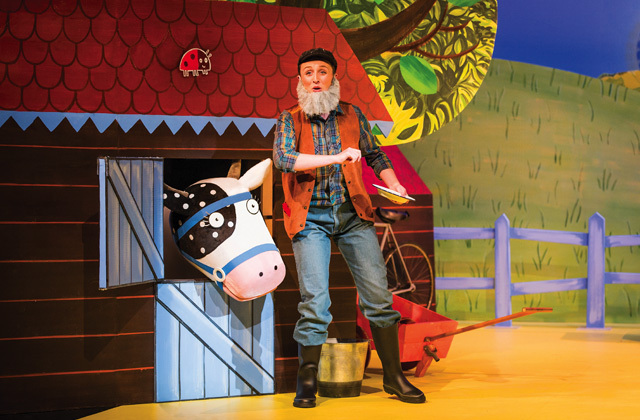 Clumsy robbers Hefty Hugh and Lanky Len have a plan to steal the farmer’s fine prize cow. But a little ladybird tries to stop them from accomplishing their misdeed, calling upon the help of all the farms’ animals. This musical version, produced by Kenny Wax in the UK and travelling the world from the West End to Singapore, manages to keep all the visual appeal of the book thanks to a very sympathetic set and costume design (Bek Palmer), which used the consultancy of none less than the book’s illustrator Lydia Monks. The show leverages the actual rhymes from the book and alternates nice tunes, puppetry, some live music, fine acting and comic gags, as well as metatheatrical elements with audience interaction aplenty. The show offers various degrees of understanding and enjoyment for the different ages. The youngest ones will be captured by the colours of the production and by the creative representation of the different animals through unexpected objects. Older children will better understand the story and interact more with the show. Finally, the adults will certainly appreciate the multiple skills of the actors: while the men (Edward Way as Hefty Hugh and Benedict Hasting as Lanky Len) displayed quite a good amount of physical acting, the women (Emma Breton as the Farmer and Emma Carroll as Lily / Ladybird) showed good singing and instrument playing (flute, recorder, violin, etc.). What surprised me the most is that my seven year old, already in Harry-Potter-Land and usually disdaining younger children’s fare, was totally captured by the show. He seemed to enjoy most the humour of the two robbers’ performance and defined the show as ‘very funny’ and ‘brilliant’. Surely all the audience must have thought the same, judging by the eager children’s participation and frequent laughing. 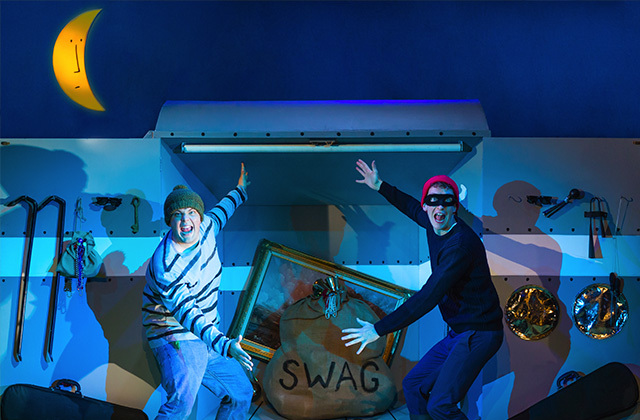 This is graceful, refined children entertainment, and makes for a perfect introduction to theatre.